A chunky knit baby blanket with 3 bold cables and a striking contrast color edging. 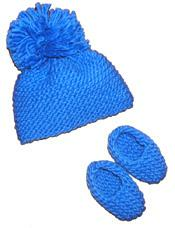 The yarn is a soft, easy-to-knit merino wool/acrylic blend. 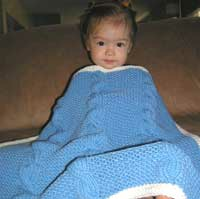 A perfect blanket to cover baby in his or her carseat or stroller. Makes for an impressive shower gift and keepsake. The pattern is easy enough for anyone wanting to try their hand at cables for the first time.